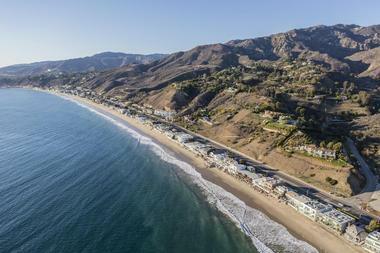 More than 20 of expansive beaches line Malibu, with all beachfront areas located below the mean high tide line accessible to the public. Many state beaches in the area offer extensive public amenities, including nature centers, hiking trails, restaurants, and public fishing piers. Amarillo Beach is a public county beach located along the eastern end of Malibu Road below Malibu Bluffs Park, accessible via Webb Way. 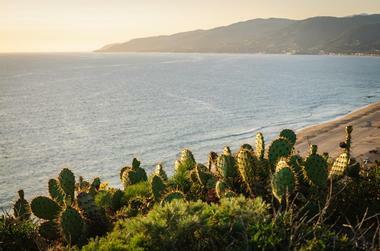 The beach is a popular spot for surfing, scuba diving, sunbathing, and beachwalking, with hiking trails connecting the beach to nearby Malibu Bluffs Park at the Santa Monica Mountains Conservancy Zone Parkland trailhead. Visitors should note that the beach's eastern end is very rocky, though its western stretch offers beautiful narrow sandy areas. During high tide conditions, little to no accessible beachfront area is available for visitor use. Visitors should exercise caution not to enter the beach's waters when its storm drain area is flowing and should be respectful of area homeowners' private lands, including driveway access points. Big Rock Beach is a narrow rocky beach in Malibu, named in honor of a large offshore rock at the beach that serves as a popular resting spot for migratory and shorebirds. The public beach is accessible via a gate along the Pacific Coast Highway and is operated by Los Angeles County, serving as a popular spot for swimming, scuba diving, birdwatching, and fishing. Visitors can also observe seals sunning along a number of rocks along the beach's shoreline, with ample space for beachwalking and viewing beautiful waterfront homes in the area. During high tide times, the beach is almost entirely underwater, though expansive sandy stretches are exposed during low tide. Visitors should note that limited public parking is available at the beach. Street parking is offered across the highway, though visitors should exercise caution in crossing the highway. Broad Beach, also known as Trancas Beach, is a narrow public beach located along Broad Beach Road, accessible via public stairs along the road or from the parking lot at nearby Zuma Beach. The beach offers ample opportunities for surfing, windsurfing, diving, bodyboarding, and fishing, with a number of tide pools exposed at low tide along the beach's northern end near Lechuza Beach making for great wading and beachcombing spots for families. During high tide conditions, the beach is almost entirely covered in water, though low tide conditions make for great beachwalking conditions due to the beachfront's gently sloping sands. Limited free parking is offered along Broad Beach Road near the beach's entrance. Dan Blocker County Beach is a public beach operated by Los Angeles County, located near Malibu's Latigo Shores neighborhood below the Pacific Coast Highway. The beach, which was formerly known as Corral State Beach, is a popular spot for swimmers, snorkelers, scuba divers, surfers, fishers, and sunbathers, with lifeguards staffed on duty at the site during the summer months. 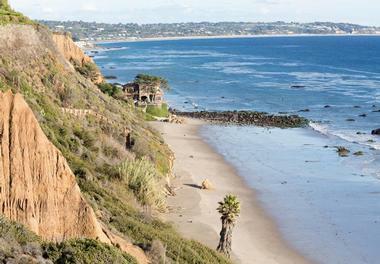 A 2.5-mile hiking loop trail embarks from the beach's parking lot, with overnight tent and RV camping sites and rental cottages offered across the highway at Malibu Beach RV Park. Parking areas for the beach are offered across the highway, connected via a pedestrian underpass, and nearby at Corral Canyon Park, a part of the Santa Monica Mountains National Recreation Area. 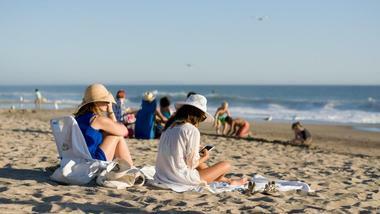 Public amenities include restrooms, picnic tables, and the Malibu Seafood Fresh Fish Market and Patio Cafe. El Matador State Beach is one of three public beaches located within Robert H. Meyer Memorial State Beach, which is located within the Santa Monica Mountains National Recreation Area between nearby Point Dume and Leo Carrillo State Beaches. As the closest beach within the state beach area to Malibu, the beach is accessible via the Pacific Coast Highway and offers a public parking area with day-use picnic sites overlooking the Pacific Ocean. Swimming, snorkeling, and sunbathing are popular activities during the summer months, with a hiking trail offered to explore the region's unique eroded bluff formations. The beach's striking scenery makes it a popular spot for professional and amateur photography, with caves located along the beach's northern end that are available for exploration. Trails also connect the beach to nearby La Piedra State Beach and Lechuza Beach. El Pescador State Beach is the westernmost beach within Robert H. Meyer Memorial State Beach, located within the Santa Monica Mountains National Recreation Area near La Piedra and El Matador State Beaches. 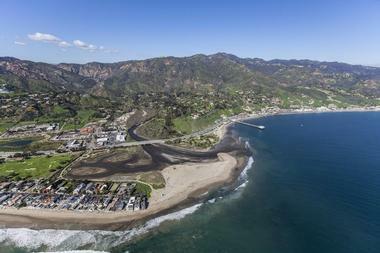 The beach is accessible via the Pacific Coast Highway within Malibu's western end, offering a private parking lot for beach visitors with an access hiking trail provided to the beach. The lovely sandy cove beach is home to tide pools on both ends, with ample space for sunbathing, beachcombing, and birdwatching offered along the beachfront. The county-operated El Sol Beach is directly connected to the beach, only accessible from the beach's western end. 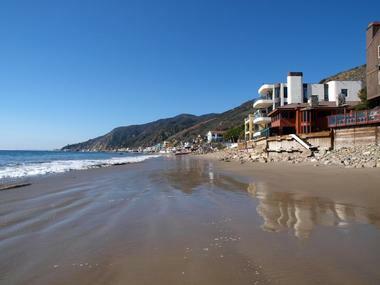 El Sol Beach is a county-operated public beach within Malibu that was originally purchased by Los Angeles County in 1976, serving as one of the region's best-kept secrets. 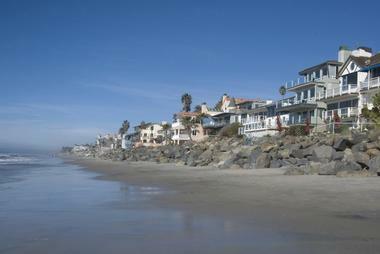 The beach has been the source of regional controversy since the late 20th century, as a number of wealthy landowners within the area, including former Disney president Michael Eisner, have opposed the construction of public beach access stairways, preferring to keep the beach hidden away from tourist crowds. 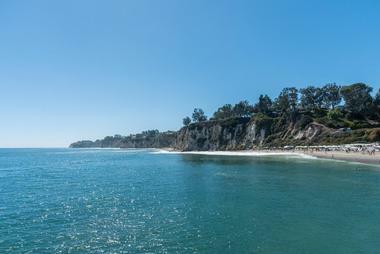 Today, the beach is commonly known by the nickname "Disney Overlook" due to its association with Eisner, only accessible via trails from adjacents Nicholas Canyon County and El Pescador State Beaches. Both trails are best accessed at low tide, with opportunities for secluded beachwalking and beachcombing provided for visitors. Escondido Beach is a county-operated beach in Malibu that faces the Pacific Ocean coast to the south, located just east of Point Dume. The beach is accessible via a public gate and bridge at Escondido Creek along the Pacific Coast Highway, along with a public access stairway located near the Geoffrey's Malibu restaurant. Visitors should note that public parking at the beach is extremely limited, with street parking spaces located near Malibu Cove Colony Drive and Geoffrey's. Though limited beachfront area is offered at high tide, the beach is a popular spot for scuba divers, kayakers, and beachcombers during low tide conditions, with enough beachfront sand area available to walk to adjacent Paradise Cove. Visitors should note that no public facilities are offered at the beach and that dogs are not permitted on the beachfront area. 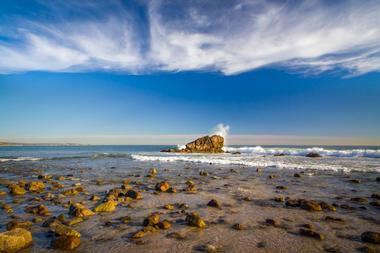 La Piedra State Beach is one of three beaches within Robert H. Meyer Memorial State Beach, located within the Santa Monica Mountains National Recreation Area between El Matador and El Pescador State Beaches. The beach is accessible via a paid visitor parking lot near the Pacific Coast Highway, which offers a hiking trail and public stairway for beach access. 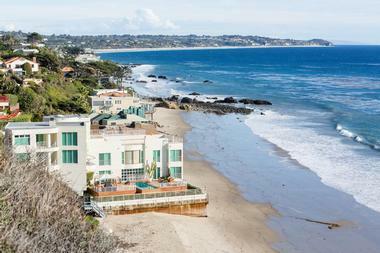 Though many multimillion-dollar homes are located just off the beachfront, the beach's terrain keeps its sandy areas fairly private. Sunbathing, birdwatching, and beachcombing are popular activities, with tide pools exposed during low tide conditions. Public restrooms are offered at the site, along with day-use picnic tables. Las Flores Beach is a charming sandy beach located at the eastern end of Las Flores Creek near the Pacific Coast Highway and Las Flores Canyon Road. Though a parking lot is offered near the Duke's Malibu restaurant, the beach is no longer accessible from the parking lot, though visitors can walk to the beach from nearby Big Rock Beach at low tide times. Several other unofficial access points are offered, though visitors should note that alternate access points are frequently unofficially closed by area homeowners. Approximately 2.7 miles of beachfront make for great beachwalking conditions during low tide times. 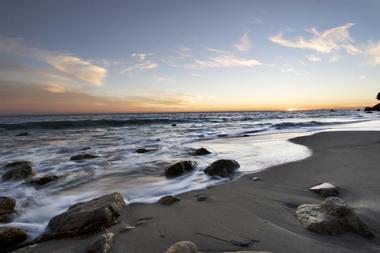 Las Tunas Beach is a rocky county-owned beach in Malibu's eastern end, located directly along the Pacific Coast Highway. The narrow beach is a popular public fishing spot throughout the year, though sound pollution from the nearby highway frequently drives away tourists looking to sunbathe in the area. Scuba diving and swimming is common in the beach's waters, with beachwalking areas exposed during low tide conditions connecting neighboring beaches and waterfront areas on each side. A small visitor parking lot is offered along the highway, with lifeguards staffed on duty during the summer months and public restroom facilities available for visitor use. 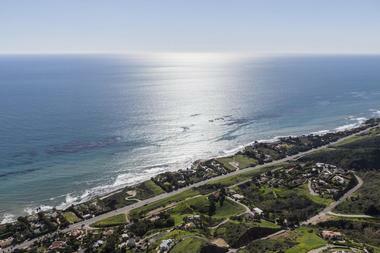 Latigo Beach is a county-owned beach on the eastern end of Malibu's Latigo Point, accessible via the Pacific Coast Highway and Latigo Shore Drive. The secluded, calm beach is a great spot for sunbathing, with ample space for beach strolling all the way to nearby Escondido Beach offered during low tide conditions. Tide pools are exposed during low tide conditions on the beach's western end, with access to nearby Dan Blocker Beach offered at its eastern end. Visitors should note that while free street parking is available in the area, parking outside of private streets is recommended to avoid complaints from nearby homeowners. All beach visitors must stay at least 16 feet away from condominiums and homes lining the beach's waterfront area. During rainy conditions, no swimming signs may be posted due to surges from the area's storm drains. Leo Carrillo State Park is one of Malibu's most family-friendly beaches, located in western Malibu and accessible via the Pacific Coast Highway. The beach park is split into northern and southern sections, which are divided by the rocky Sequit Point, home to ample tide pools and caves which may be explored during low tide conditions. Near the beach's northern section, adjacent Staircase Beach is a popular spot for surfers, with hiking trails traversing the nearby state park area. Visitors love to swim, scuba dive, fish, whale watch, and bike in the area, with dogs permitted on leashes in the beach section north of its third lifeguard station. Overnight camping is offered at Leo Carrillo State Park, with free visitor parking offered along Mulholland and Pacific Coast Highways. 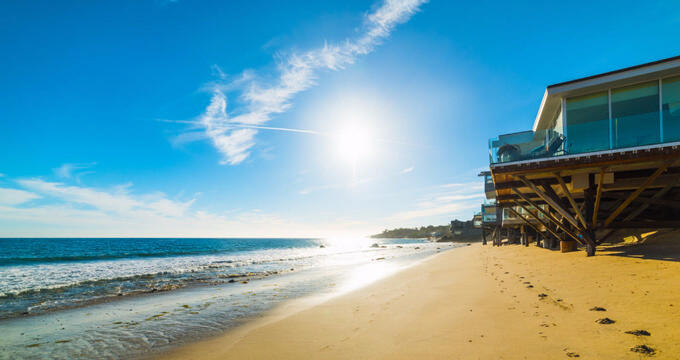 Malibu Colony Beach, also known as Malibu Beach, is a narrow public beach located in front of the gated private Malibu Colony Road, which is home to spectacular beach homes and mansions. Visitors can access the beach at low tide conditions from Malibu Lagoon State Beach or via Malibu Road, with paid parking offered at nearby Malibu Lagoon State Park or free parking offered along the Pacific Coast Highway and Malibu Road. Beachwalking and swimming are popular visitor activities, with tide pools exposed during low tide conditions along the ends of the beach making for great wading and beachcombing spots. Malibu Lagoon State Beach is a California state beach located at the terminus of Malibu Creek at the Pacific Ocean, which forms beautiful Malibu Lagoon during the summer months. 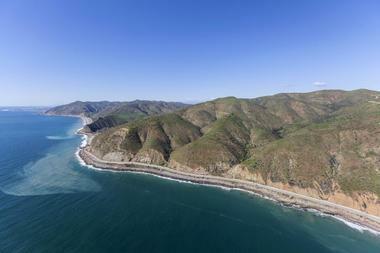 The beach is accessible via the Pacific Coast Highway, with a parking lot available for visitor use at the highway's intersection with Cross Creek Road. Surfing, swimming, sunbathing, and wildlife watching are popular activities at the beach, with tide pools exposed during low tide conditions. Lifeguards are staffed on duty during peak times, with public art pieces and interpretive signage offered along the beach's birdwatching trail area. The state beach is also home to the Malibu Lagoon Museum and the historic Adamson House, which is open to the public as a living history facility. Malibu Surfrider Beach is a popular surfing spot located near Malibu Lagoon within Malibu Lagoon State Beach, accessible via its own parking lot area along the Pacific Coast Highway. 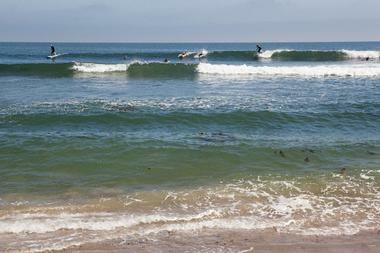 The beach offers excellent wave conditions for intermediate-level riders, noted for its prime long right-hand break. Fishing spots are offered at the Malibu Sport Fishing Pier, with a sand volleyball court offered along the pier's side. The Malibu Farm restaurant and cafe are located on the pier, while the historic Adamson House and the surfing-focused Malibu Lagoon Museum are accessible via the beach's parking lot. A separate swimming beach is offered nearby within Malibu Lagoon State Beach, with lifeguards staffed on duty during peak times. Nicholas Canyon County Beach is a long, spacious beach in western Malibu located along the Pacific Coast Highway approximately one mile from Leo Carrillo State Park, owned and operated by Los Angeles County. The beach is also commonly referred to as Point Zero by area surfers for its excellent wave break conditions, primarily accessible at the point where San Nicolas Canyon meets the Pacific Coast shoreline. Lifeguards are staffed on duty for swimmers during the summer months, with ample opportunities also offered for scuba diving, windsurfing, fishing, and sunbathing. Food trucks are parked on site at the beach during peak times, with day-use picnic sites scattered throughout the beach area. 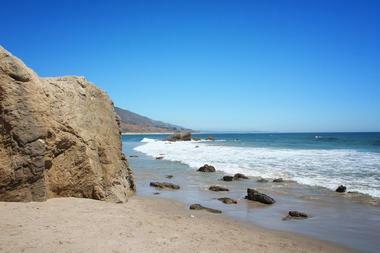 Overnight camping sites and hiking trails are offered for visitor use at nearby Leo Carrillo State Park. 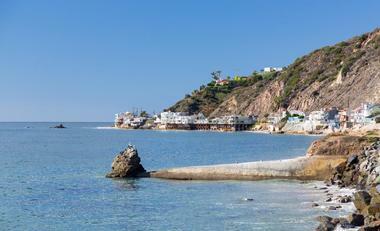 Paradise Cove Beach is a public beach in Malibu located in front of the privately-owned Paradise Cove facility, which is home to the delicious Paradise Cove Cafe. The beach has been used as the setting for a number of feature films and television series filmed in Hollywood, showcasing beautiful wide sandy beachfront areas and a private pier. Though steep parking fees are charged at the beach's private parking lot, restaurant diners can receive free or discounted parking rates for up to four hours of parking time. Swimming, fishing, sunbathing, and tide pooling are popular activities, with sandstone cliff vistas and immense Malibu mansions making for beautiful scenery for beachwalking. 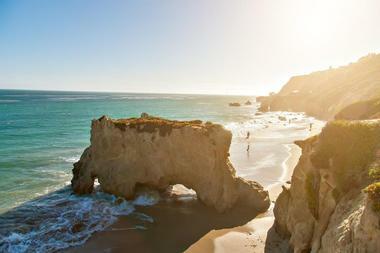 Surfing has been permitted at the site within recent years due to new regulations by the California Coastal Commission. 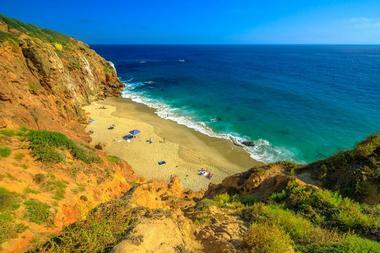 Pirates Cove Beach is a hidden-away sandy beach near Malibu's Point Dume, best known as the filming location for the iconic final beachfront scene in the original 1968 Planet of the Apes feature film. The beach, which is located within Point Dume State Marine Reserve and overseen by Los Angeles County, is a popular spot for hiking and photography due to its unique natural features, including a high rock wall with a rugged path leading up to large boulder piles near adjacent Westward Beach. 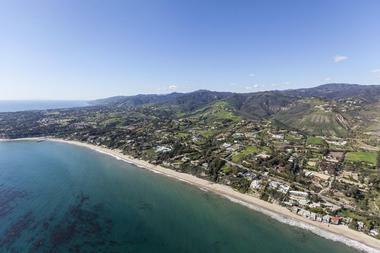 An observation platform is also accessible within nearby Point Dume State Beach, offering unparalleled views of the cove and nearby Point Dume. Visitors should note that beach access can be tricky at high tides, with water conditions making the access point at Westward Beach impossible during some tide conditions. 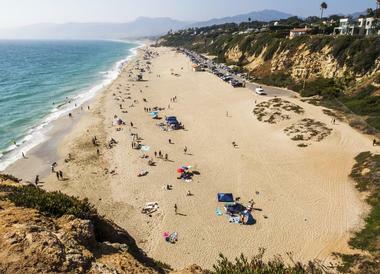 Point Dume State Beach, also known as Big Dume Beach and Dume Cove Beach, is a popular state beach in Malibu, accessible via the nearby blufftop Point Dume Natural Preserve. The beach is a popular spot for scuba diving, surfing, fishing, and wildlife watching throughout the year, with opportunities to spot migratory birds, shorebirds, and whales from the coastline. Tide pools are exposed on the beach at low tide conditions, with a number of nature trails offered for hiking throughout the nearby nature preserve area. Visitors can also rock climb along the bluff or access nearby Little Dume Beach and Paradise Cove as part of beachwalking excursions. Limited free street parking is available on Cliffside Drive, with paid parking available at the end of Westward Beach Road. 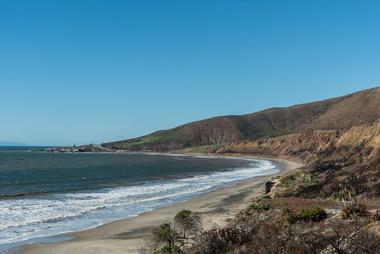 Sycamore Cove Beach is a day-use beach within southern Ventura County's Point Mugu State Park, serving as the gateway for the Boney Mountain State Wilderness Area and the nearby Santa Monica Mountains. An excellent public swimming beach is offered, with lifeguards staffed on duty during peak times within the summer months. A number of trailheads are offered within an immense hiking trail network adjacent to the beach, embarking along Sycamore Canyon Road across the Pacific Coast Highway from the beachfront. A large campground is also offered across from the beach with sites for overnight tent and RV hookups, along with day-use picnic and barbecue grill sites and a nature center offering public programming throughout the year. Topanga Beach is a county-owned beach in Malibu best known as the city's closest public beach to Los Angeles, located along the region's eastern Pacific Ocean coastline near the Pacific Palisades neighborhood. The beach is a popular surfing spot throughout the summer months, with excellent wave conditions offered near the sandy point at Topanga Creek and its nearby lagoon. Fishing, scuba diving, and sunbathing opportunities are also offered, with beachwalking permitted during low tide conditions. 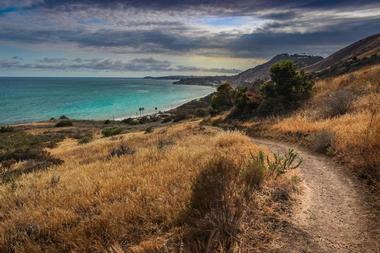 Nearby, Topanga State Park offers opportunities for hiking and mountain biking. A paid public parking lot is offered at the intersection of Topanga Canyon Boulevard and the Pacific Coast Highway, with free street parking offered at several areas along the highway nearby. Westward Beach is an expansive beach near Malibu's Point Dume, located within Zuma County Beach Park at the southern end of the three-mile Zuma County Beach. The beach is a popular swimming and surfing spot throughout the summer months, with lifeguards staffed on duty at peak times. Fishing and sunbathing are also popular visitor activities, with hiking trails embarking from the beach's parking lot into nearby Point Dume Natural Preserve. The secluded Pirates Cove Beach, best known as a filming spot for the 1968 feature film Planet of the Apes, is accessible via the southern end of the beach. Beach visitors can also dine at the fine-dining restaurant The Sunset, which is open for lunch and dinner service daily. Zuma Beach is a beautiful two-mile beach within the popular Zuma County Beach Park in Malibu, offering one of the region's only undeveloped beachfront areas, in contrast to many other regional beachfronts with mansions and condominiums developed between the beach and the Pacific Coast Highway. The large beach is a popular spot for swimming, surfing, windsurfing, bodyboarding, fishing, and scuba diving, with lifeguard stations located throughout the beach to protect beachgoers at peak times. Visitors should note that strong rip currents can develop suddenly at the beach and are advised to exercise necessary caution within waters. Volleyball courts are offered along the beachfront, with children's play areas, day-use picnic tables, restrooms, showers, and snack bars available for visitor use.